I'm sure you know of my paradox. Loving breakfast but not wanting to get up for it. Especially Sunday. And an Asian Brunch? Where I know there are no waffles and pancakes and dosas. Forget it. Did it once for Chef Vikram at Pan Asian and would do it every Sunday for his food, but otherwise an Asian Brunch on Sunday is not very appealing for someone like me who struggles to wake up for dinner on Sundays, forget brunch. But a new chef is in town. 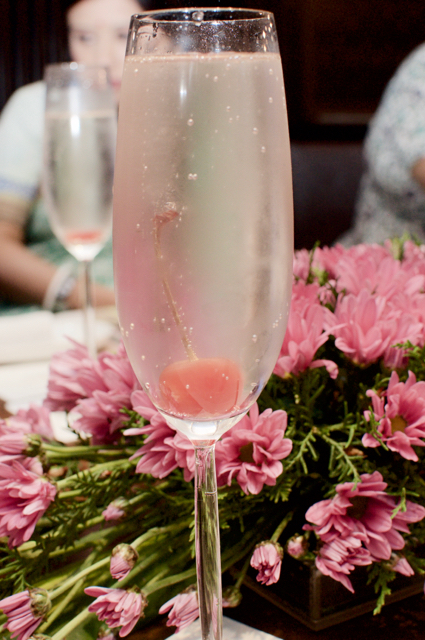 And he has stepped into the shoes of somebody I (and a lot of foodies in Chennai) adored and loved and while we wished him the very best for Tian (ITC Maurya, New Delhi), we secretly wished he stayed back here. I know it is going to be unfair to compare two chefs, but with Pan Asian it would be inevitable. Especially if we are doing a chef's table where good is not enough. Excellent is the only way out. At a chef's table nothing matters. Not the name of the restaurant, not the waiters, the service, nothing. Its the chef all the way! Our brunch started off with a Sashimi. Presentation was fantastic and portions sizes were perfect when you need the space for a 9-10 course meal. 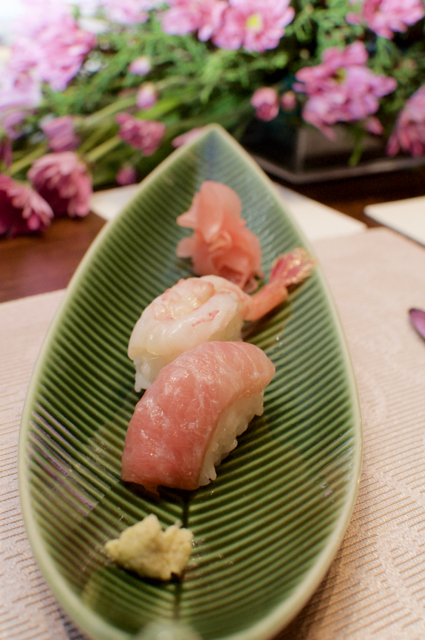 While the premium fatty tuna and salmon was great, what I loved even more where the subtle ones - the fresh wasabi. I've never seen what it looks like and have never tasted a freshly grated one and I loved every morsel of it. 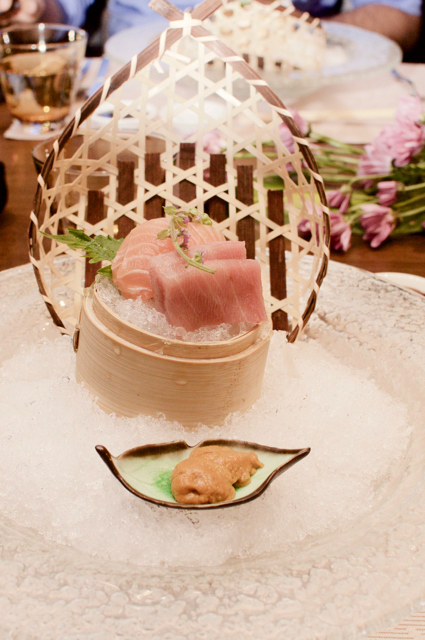 It is less pungent, but equally flavourful and added a beautiful element to the sashimi. 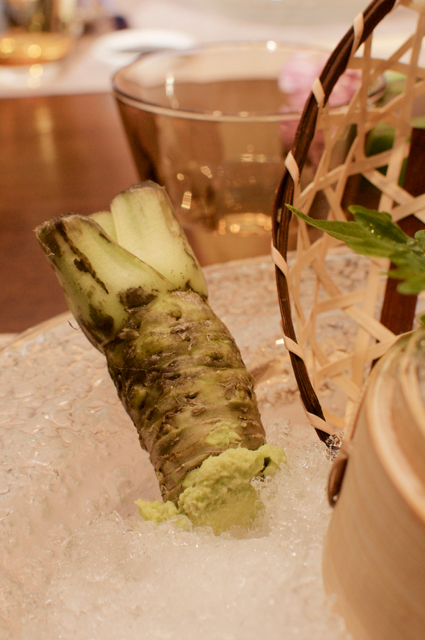 This with the Shisho leaf and Hanaho flower made up a great first course. Oh, there was little sea urchin full of flavour sitting right at front of the plate! Bang, we're on! 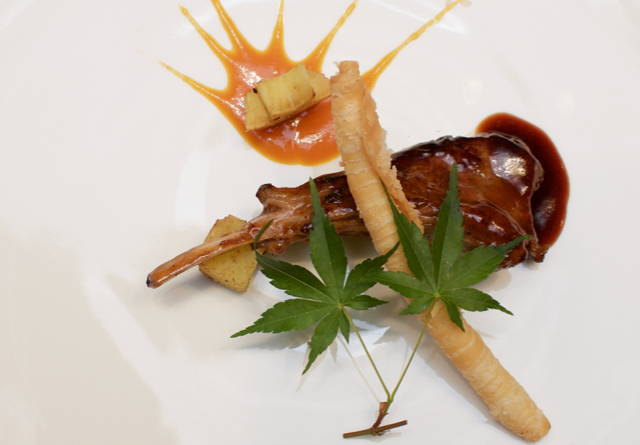 Next came a stunning Asian interpretation of the classic Fish n Chips. At least the fish part of it. A crispy fried John Dory (not the man, the fish), with a hint of garlic and chilli, shaped like hand cut potatoes fries. Everything about the dish was great! This was followed by another first for me, a scallop dim sum with salmon caviar (or caviar-like). 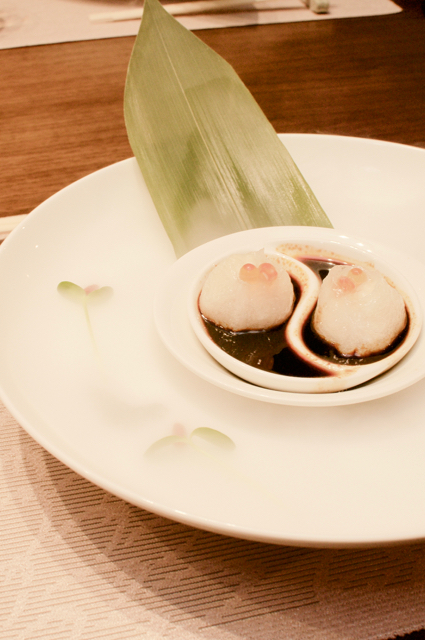 It was a different experience to have scallop in this form and lovely nonetheless. 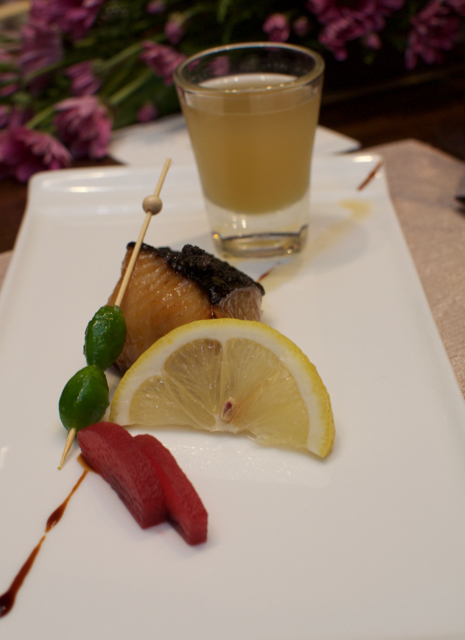 This was followed by the the grilled black cod that was mouth watering, but the smaller element, the poached pears were refreshing and added beautiful supplement to the dish. Then came the course I had to refuse to complete. Completely didn't like the duck at all. While I'm not a fan of duck meat, in most chef tables, I end up liking them, but not here. Completely put me off! Thankfully, the duck was followed by a beautiful lamb! Again, while the lamb was great and all, the chef added an interesting element, a hand rolled puff pastry, like a cigar that complemented the lamb really well! Then came two not so great courses to finish off. 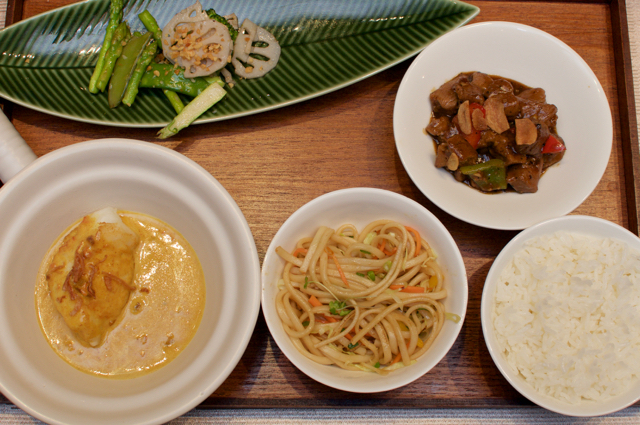 While the platter with the chilean sea bass yellow curry and wok tossed lamb came with noodles and jasmine rice, it was non-flattering and simply did not live up to the first three quarters of the meal. Desserts were a hit and miss. The platter had some strawberry with yuzu, a chocolate and hazelnut thingy and a macaron. While the chocolate hazelnut stuff ( I don't know what to call it) was yum, it was the only thing in the platter that was nice. 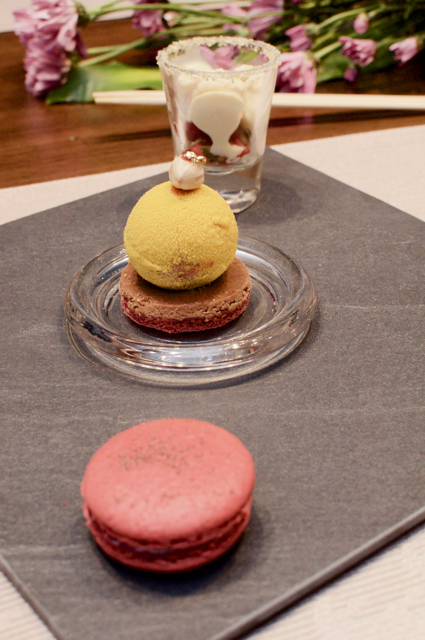 The macaron was soggy and the yuzu curd with strawberries were blah! The first set of courses more than made up for the last two as we were stuffed. While theatrics are minimal here with the focus on plating with ice and smoky, Pan Asian has an able new chef at the helm and I would like to look out for him and hope to discover more of his food. I also have the feeling to just take a plane and go to Delhi and go to Tian right away!!! 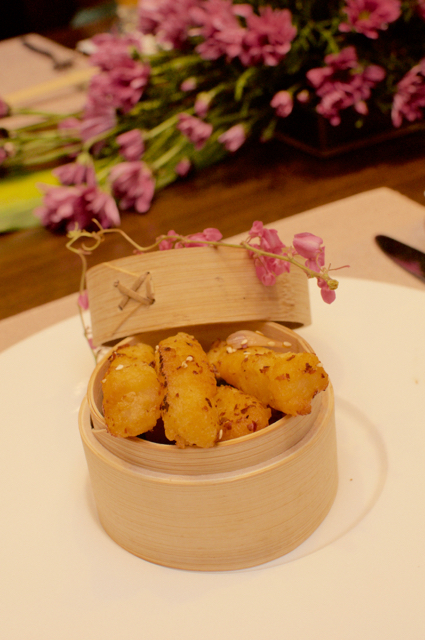 Brunch at Pan Asian without Sashimi costs Rs. 2350 nett/ and the one with Sashimi is Rs. 1000 more per person. There is no buffet, the chef just doles out course after course and all you have to do is make the decision of veg or non veg, sit back and enjoy. And long. We went it at 1 PM and left at 430 PM, so it is a nice long brunch!